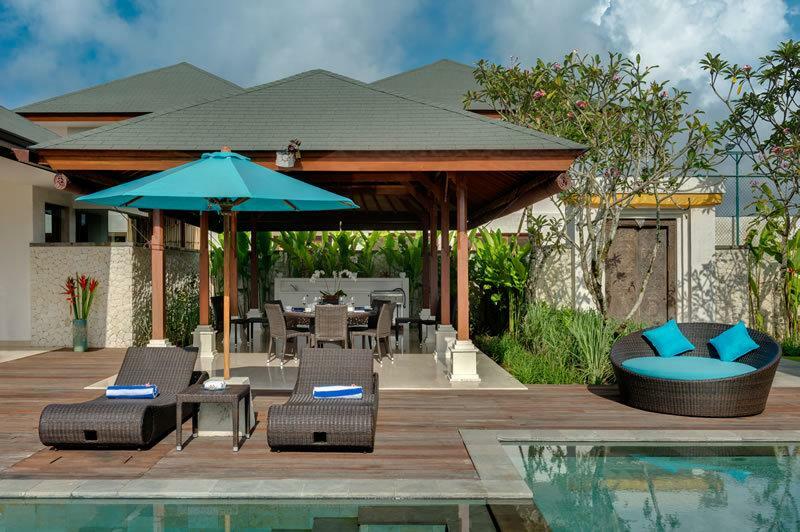 Gurgling ponds bordered by wooden decking are key features of the villa’s garden landscape and the feel is relaxed and comfortable. 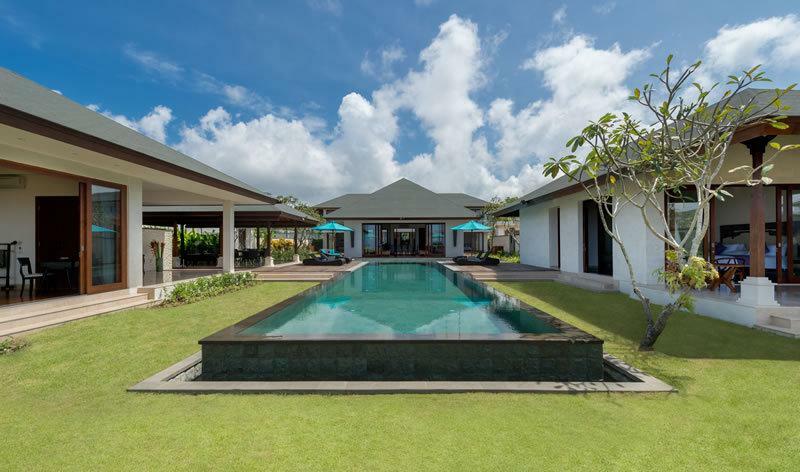 Two master bedroom pavilions lie opposite each other across the T-shaped 17-metre swimming pool (with shallow area for kids), while a glass-wrapped living pavilion sits at the heart of the villa. 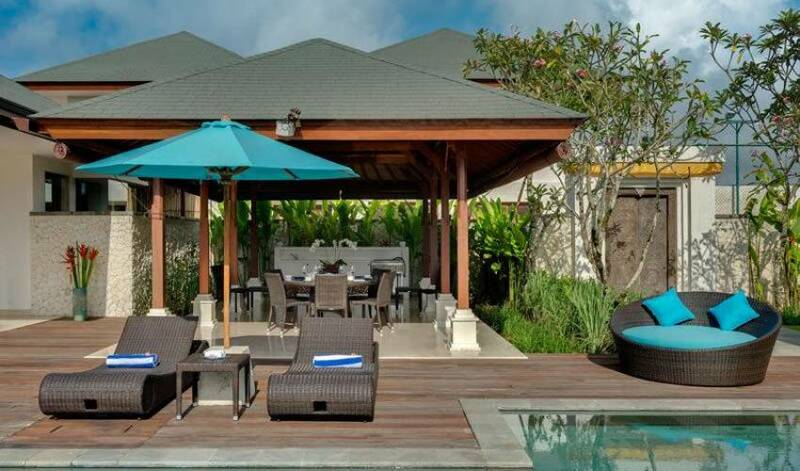 The villa also has the advantage of a spacious outdoor dining area, with built-in barbecue and kitchenette for extra convenience. Behind the living pavilion is the two-storey guest bedroom building with its four bright and spacious rooms. Bedrooms here are thoughtfully configured to offer ideal accommodation to families, with a king and a twin-bedded room on each floor. As well as having exclusive use of the leisure facilities at the villa, guests have full access to the sports centre (with squash and tennis courts), spa and gym, shared with Villa Rose, Villa Markisa and The Pala. 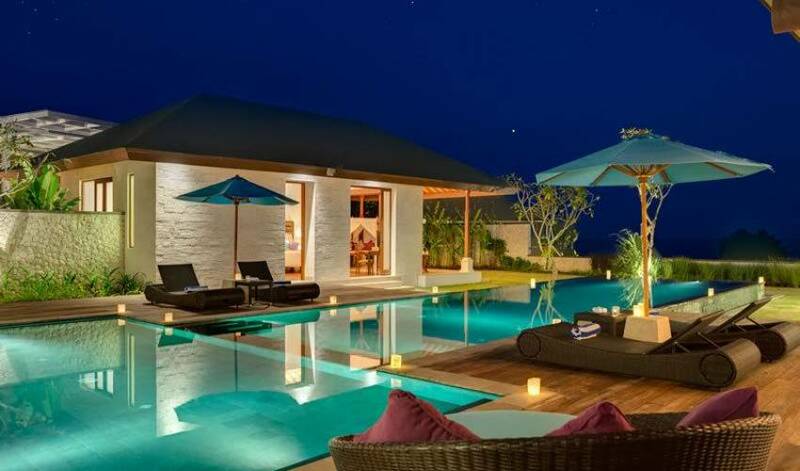 Water features and wooden decks meander between the four individual buildings that make up this six-bedroomed villa. 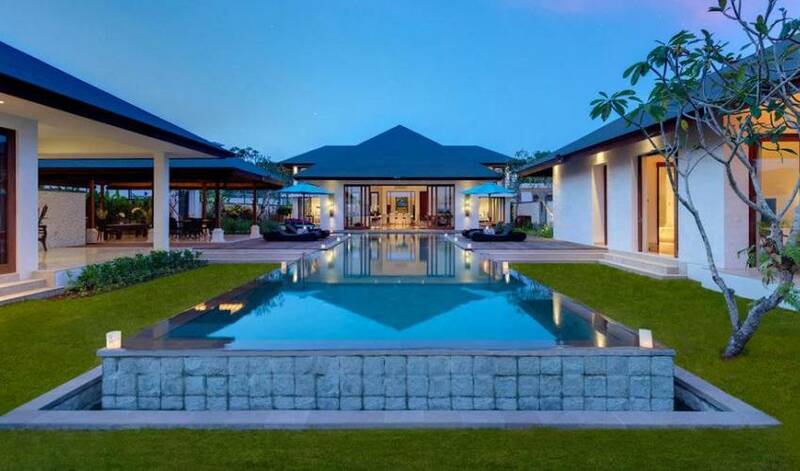 Two master bedroom pavilions, each with covered terraces, face the ocean at the front of the villa’s tropical landscaped gardens; between them lies a 17-metre T-shaped swimming pool (with shallow kids pool) and a large, covered barbecue balé. A deck crosses burbling pebble-lined ponds to the only two-storey building at this villa, which houses the four remaining bedrooms, all ensuite and two on each floor. 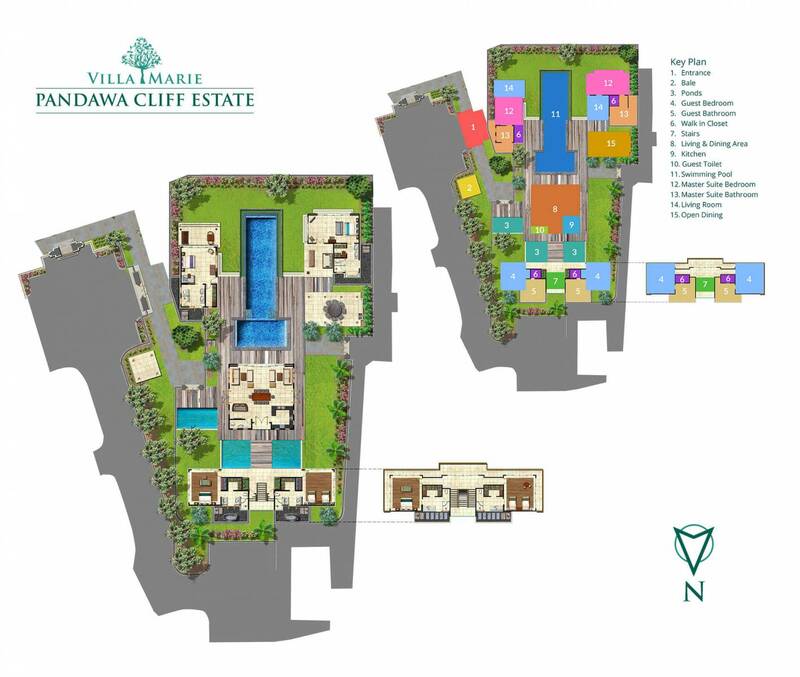 The villa’s central living pavilion houses all her indoor living space in one big, convivial area. This is a lovely room for socialising, gazing out over the pool and gardens, chilling in front of the television, enjoying a meal at the 10-seater dining table – or even cooking one in the well-equipped open-plan kitchen. This is undoubtedly the hub and the heart of the villa. 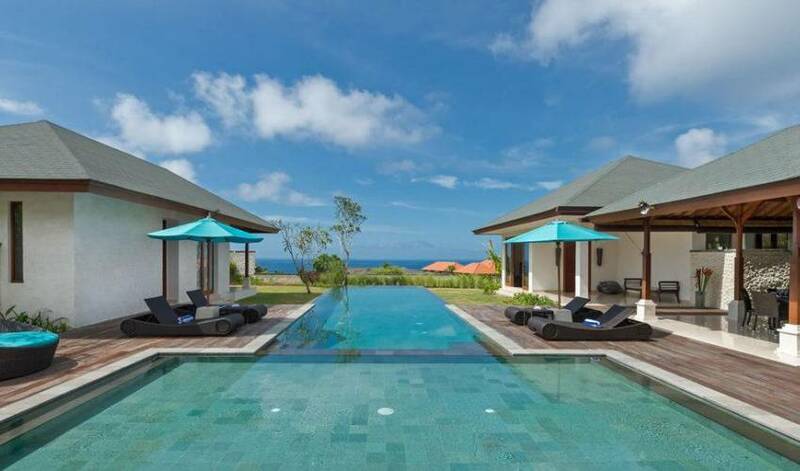 The villa’s master suites occupy two luxurious pavilions towards the front of the property. 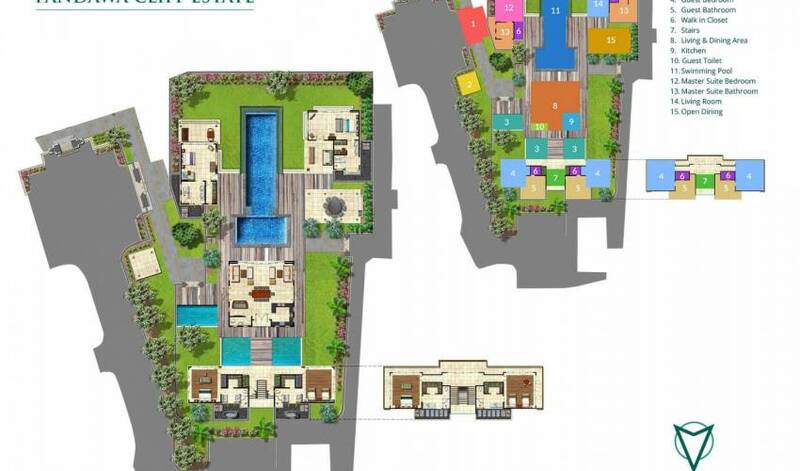 Each has wide sliding glass doors on two sides – facing the ocean in one direction and the pool in the other. A timber boardwalk over pebble-lined ponds leads from the villa’s living pavilion to her four guest bedrooms. Both floors of this contemporary two-storey building contain a king bedroom and a twin bedroom, and all rooms are virtually identical, with only minor differences in their bathrooms and outside areas (balconies for the upstairs rooms; decadent outdoor river-rock tubs for the ground floor ensuites). Floors are of warm teak framed by cool marble and bathrooms are bright and spacious – all incorporating well-designed dressing and vanity areas. 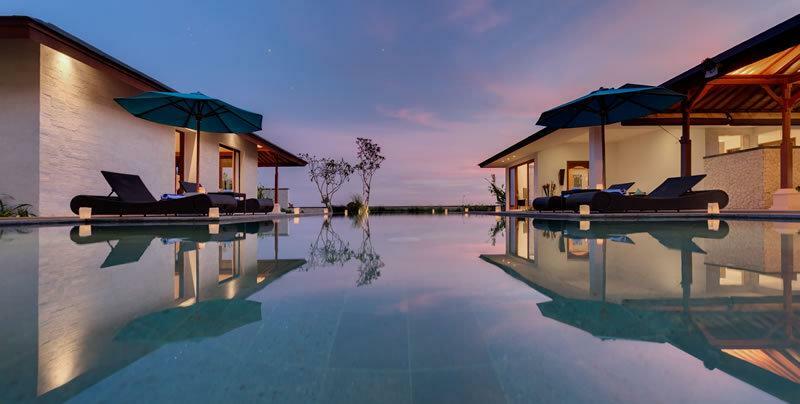 Peacefully and privately situated, at the end of a winding country lane on Bali’s southernmost tip, the estate is a hidden paradise overlooking the Indian ocean from its enchanting cliff-top setting. 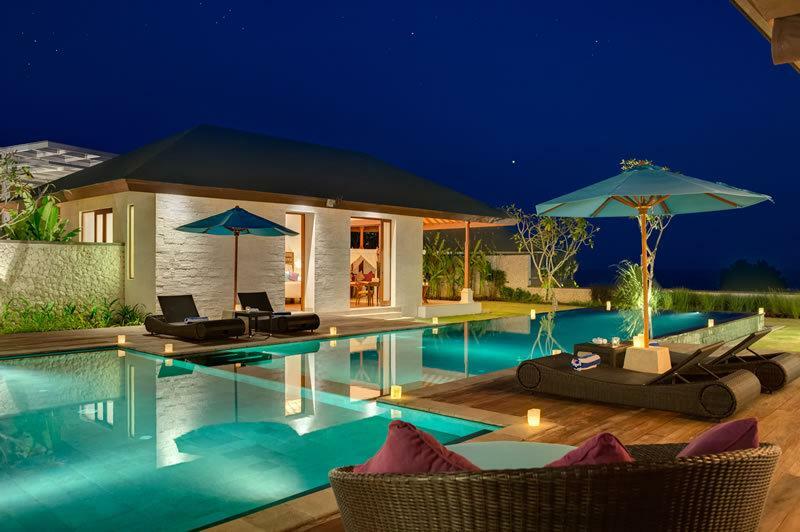 Apart from a handful of other luxury villas sprinkling the top of the cliff, and the beach huts and local cafes bordering the white sands of Pandawa Beach far below (named after the five warrior brothers of the Mahabharata epic, whose white stone statues are carved into niches along the road leading down to the beach), there is little development in this unspoiled corner of Bali. 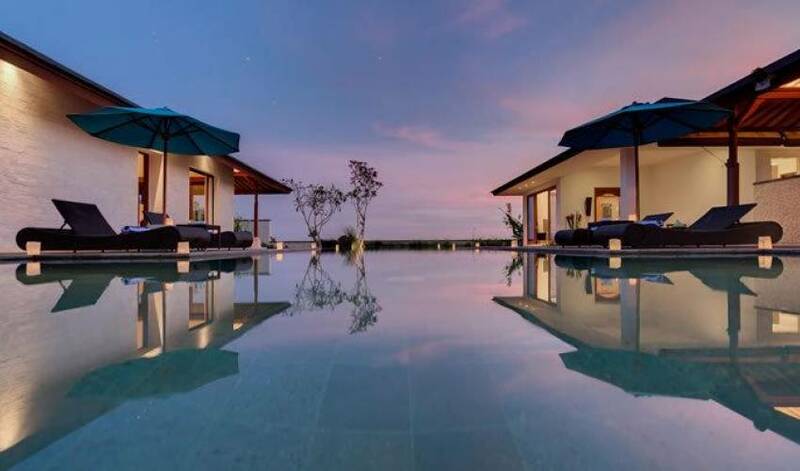 But despite it’s tranquil, rural setting, Pandawa Cliff Estate is less than 30 minutes’ drive from Bali’s international airport, and within easy reach of several glorious surf beaches, the sacred sea temple of Uluwatu, and the many restaurants and beach bars of Jimbaran and Nusa Dua.